3D Amazing Optical Illison Lamp Add Warmth and Romance to Your Life! 2. Smart Press Button: Press one time, one color light up, press it again, it turns off. Press it thirdly, another color light up. 3. Automatically color changing mode. Press the button to last color, then press it again, auto color changing mode works. 6.The whole board is solid acrylic material,not glass. Strong, hard, high toughness, not fragile, will not hurt the child. 7. Very low heat-conductive, will heat after long time working,Soft warm light, will not hurt eyes. Remove the protection film on the panel. 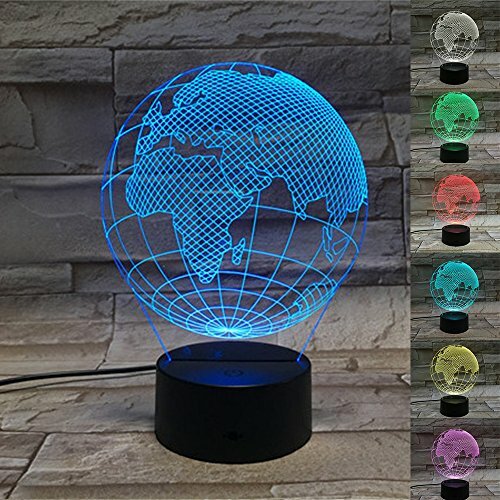 7 Color Changing night lamp: red, green, blue, yellow, cyan, pink, white.It can be fixed one color or automatically color changing mode. If you have any questions about this product by ChiMoon, contact us by completing and submitting the form below. If you are looking for a specif part number, please include it with your message.